Andrés advises his clients on issues related to Labor, Commercial and Trademark Law in Colombia. Andrés Vargas is Biz Latin Hubs Senior Lawyer and Commercial Law Specialist. Andres is one of the longest-serving members of Biz Latin Hub, and during his time leading the legal team in Colombia, he has been influential in assisting clients from a variety of countries and sectors to achieve their business objectives in Colombia. Andrés joined Biz Latin Hub shortly after the company was launched in 2014, and since then, he has consistently gone the extra mile to offer tailored solutions to his clients’ business problems, and with the highest level of professionalism and attention. “I particularly enjoy developing tailored solutions to our client’s problems. Delivering results and keeping the clients happy is the most important part of the job for me”. – Andres Vargas, Senior Lawyer of Biz Latin Hub. In 2012, Andrés graduated from the Universidad Sergio Arboleda in Bogota, and after working in a variety of positions (labour law advisor, head of commercial law etc), he joined the Biz Latin Hub Team in September 2014 shortly after the company was launched. Andrés has expertise in various areas, specialising in labour, commercial and trademark law. 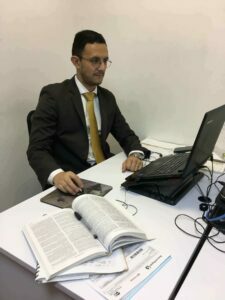 Since joining Biz Latin Hub he has developed his intercultural communication skills and possesses a fluency in English. What Andres likes the most about working at Biz Latin Hub is working directly with clients and being part of their commercial success in Colombia. Andrés breaks all stereotypes surrounding lawyers. Andrés breaks all of the stereotypes surrounding lawyers. During his free time, and as a way to channel his energy, André’s practices karate. 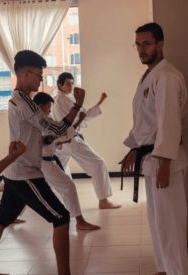 He has been involved with Karate since the age of 11, holds a black-belt, and in addition to practising, also teaches children the technical aspects of the ancient martial art. If you would like to get in touch with Andrés and/or our team in Colombia, feel free to send us an email with your enquiries at [email protected]. Our tailored service provision will ensure your business success in Colombia and Latin America.